This is one of the best fishing charters in the Gulf, and has received many accolades as a result. 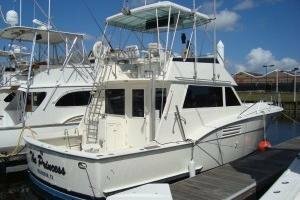 This Hatteras will take you offshore in comfort with a great ride to the fishing grounds. She features a large fishing deck, a fighting chair, two staterooms, a TV, and a stereo. Half-day pricing reflects Coastal Fishing (up to 5 miles out for 5 hours) where you can catch Sharks, Red Drum, Sting Rays, Spanish Mackerel, Bull and Slot Red Fish, Whiting, Trout, Croaker, Black Drum, Sheep Head, and Spade Fish among others. Pricing reflects 1-4 people. Each additional person over 4 will be $60. Full-day pricing reflects Near Coast Fishing (up to 50 miles out for 8-10 hours) where you can catch Red Snapper, King and Spanish Mackerel, Ling, Shark, Dorado, Trigger, and Vermillion. This boat can also take you Offshore (80 to 150 miles out) which are overnight trips that last about 40 hours. Pricing is $7,560.